York City’s four season stay in the Football League is under serious threat this term. The Minstermen, who had finished in the play-off places during the 2013-14 season, dropped to the lower reaches of the table last term, before a nightmare start to the current campaign. Boss Russ Wilcox was dismissed on October 26 after managing just two league wins since the start of the season, as he was replaced by ex-Dundee United manager Jackie McNamara. The new Minstermen chief struggled to turn things around at the beginning of his reign, as he started with a 3-2 defeat at Accrington, before six straight losses, including a 6-0 hammering at Portsmouth and 5-1 home humiliation by Stanley. That stretched the club’s run of consecutive defeats to nine in all competitions, before the first shoots of recovery on December 19 as York defeated Morecambe 2-1 and then drew 1-1 at Mansfield. Two further single goal defeats followed, but York then won three from four, including a trio of of home successes in a row, seeing off Stevenage, Notts County and Exeter. The revival has stunted somewhat in the last two games with back-to-back-defeats against Cambridge and Northampton, as they sit second from bottom in the table, although only behind Yeovil on goal difference, with just 14 games to go. Boss McNamara has been successful in his attempt to bring Huddersfield Town defender Will Boyle back to Bootham Crescent though, as the 20-year-old centre back has penned a deal to the end of the season after impressing in his six appearances before the turn of the year. Meanwhile, striker Bradley Fewster has agreed to stay until May, while the Minstermen were active in the loan market recently, signing ex-Scotland striker Derek Riordan on a deal to the end of the season and Newcastle’s Lubo Satka on loan for a month. However, full-backs Marvin McCoy and Anthony Straker have been released, as has fellow defender Eddie Nolan, with striker Emile Sinclair loaned to Guiseley too. Team news: Hatters don’t have any new injury doubts for the clash, with Stephen O’Donnell passed fit, leaving just Nathan Doyle (knee) and Josh McQuoid (knee) out. For York, Femi Ilesanmi is likely to return from a hamstring injury, while Danny Galbraith (groin) and James Berrett (dead leg) should be back in contention, although Michael Coulson is set to miss out. Top scorers: Hatters: Cameron McGeehan (11). Minsterman: Vadaine Oliver (9). Man in the middle: Geoff Altringham - took the opening game of the season for Hatters at Accrington in a 1-1 draw. Since then has shown 72 yellows and six reds in his 28 matches, including three dismissals in his previous seven games. Only officiated one other Luton match, that the FA Cup 1-0 victory over Wolves in January 2013. Assistant referees are Thomas Bramall and David Richardson with fourth official Wayne Grunnill. In charge: Jackie McNamara - 42-year-old former Scotland international, who won 33 caps for his country during a career where he played for Dunfermline Athletic, Celtic, Wolverhampton Wanderers, Aberdeen, Falkirk and Partick Thistle. Moved into moved into management with former club Partick Thistle in April 2011, reaching the Scottish Challenge Cup final before his appointment at Dundee United in January 2013. Was sacked by the Tangerines in September 2015, and two months later took over as manager of York City. View from the opposition: York midfielder Russell Penn speaking to the York Press: “They’ve got a good squad and are pretty similar to Notts County, in my eyes, because they have some big names. One to watch: Bradley Fewster - 20-year-old striker who recently extended his loan deal at York from Championship side Middlesbrough until the end of the season. Scored on his debut in a 5-1 home defeat to Accrington, and has gone on to net four times in total, including both goals in the 2-0 home win over Exeter earlier this month. Friendly faces: Alex Lawless - midfielder joined York on a free from Forest Green in July 2009, making over 50 appearances for the club before joining Luon on loan on November 2010, making the deal permanent in January 2011. Team-mate Jonathan Smith had two spells at Bootham Crescent, his first in August 2010 to June 2011, before moving to Swindon for £30k. Returned to the Minsterman in July 2012, staying for three months before Luton snapped him up for £50k. Played for both: Janos Kovacs - Towering centre half spent a month at York City on loan in March 2007, playing eight times, scoring once for the Minstermen. Moved to Luton a free transfer in January 2010, but signed for Hereford in August of that year, until he re-joined Luton in September 2011, and stayed for a further 18 months, leaving the club in July 2013 after 91 appearances and eight goals in total. The 30-year-old Hungarian went back to his home country to play for Honved and Siofok, before a move to Szigetszentmiklos, most recently featuring in a 3-0 Division Two defeat at Zalaegerszegi. We’ve got form: The Hatters have a truly miserable recent record at Bootham Crescent, after a fairly decent first few years on their travels. In the early days, Luton’s record was a respectable three wins, three draws and just two defeats from their opening eight visits, including a five match and 31-year unbeaten record from 1979-2010. However, since that 0-0 draw in the Conference, Luton have failed to register a victory with four defeats and one further stalemate, meaning since Ian Hillier scored in a 2-1 win on September 15, 2001, they haven’t found the back of the net, a run spanning 556 minutes of football. In fact, York have been a real bogey side wherever Luton have faced them for the last decade as since Steve Howard scored two in a 2-1 win in Feburary 2002, they have enjoyed just one win in 13 games, and that was against nine men back in January 2011. 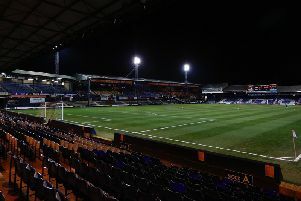 At Bootham Crescent, Hatters overall record since games started with a 5-1 Division Four defeat back in 1967 is three wins, five draws and six defeats from their 14 matches, scoring 13 times and conceding 22. Last time out: Luton were held to a 0-0 draw by York City in their visit to Bootham Crescent last season. Hatters came close to ending their drought trough Luke Rooney late on, but he was denied by a superb Michael Ingham save. Hatters: Mark Tyler, Curtley Williams, Scott Griffiths, Luke Wilkinson, Alex Lacey, Jake Howells (Luke Rooney 52), Jonathan Smith (Jim Stevenson 62), Andy Drury, Pelly Ruddock Mpanzu, Luke Guttridge, Mark Cullen (Ross Lafayette 82). Subs not used: Elliot Justham, Paul Connolly, Shaun Whalley, Alex Wall.